Accommodations for two nights in deluxe 4-bedroom cottages, Friday wine and cheese event, & a group dinner on Saturday. Cottages have gas fireplaces, free wireless, flat screen TVs and fully-equipped kitchens with dishwasher, range and microwave oven. This event has a limited number of single rooms available at $235. There is an additional non-member fee of $25. Registration must be made through the Club’s website with full payment at time of registration. Timberline and Canaan Valley Ski Resorts are 20 minutes away for alpine skiing. 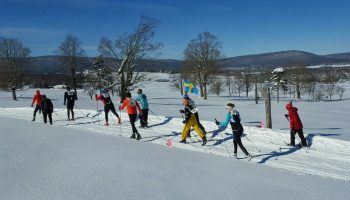 The White Grass XC Center is also 20 minutes away and Blackwater Falls has an excellent XC trail system for Nordic skiing at all levels. XC ski right out the back door of your cottage!